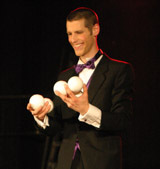 Juggling, comedy and variete shows between 10 and 60 minutes. 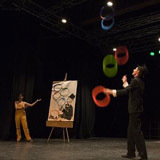 Luke Burrage presents full length theatre shows featuring juggling, comedy, video projection, audience interaction and much more. Luke performs shows both as a solo artist and alongside Pola Breandle. By combining numerous different routines the full show can run for any duration between 10 minutes and 1 hour. These unique and original routines have been developed by Luke Burrage over hundreds of shows in the past 5 years. 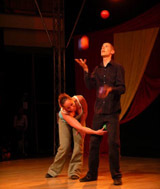 fast paced, high skill juggling, fully choreographed to music. 5-6 rings, 5-7 balls, 4-6 clubs, 3 clubs (or knives or glowclubs or fire torches). the classic circus prop presented in a quick and quirky style. 1 diabolo, vertical diabolo, 2 diabolos, glow diabolo finale. 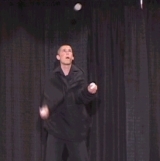 in "The Most Difficult 3 ball Juggling Routine Ever" Luke gets tangled up in his jacket but just keeps on juggling! Luke needs help holding his balls as they are just too big to juggle by himself. "Every throw has a name, every catch has a name, every trick has a name." 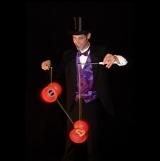 A multimedia presentation of how juggling works. Also possible without video. another video piece where Luke warms up and then fights himself on stage. 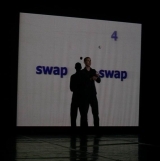 a duo routine with Pola Braendle. Juggling and performance painting in one act.